Home > Party Information > Long Live May Day, Born in the USA! As people the world over know, the celebration of May Day as a labor holiday began in connection with the events that transpired on and around May 1, 1886 in Chicagos Haymarket Square, and that the Haymarket Square rally was itself part of a nationwide workers struggle for the eight-hour day. 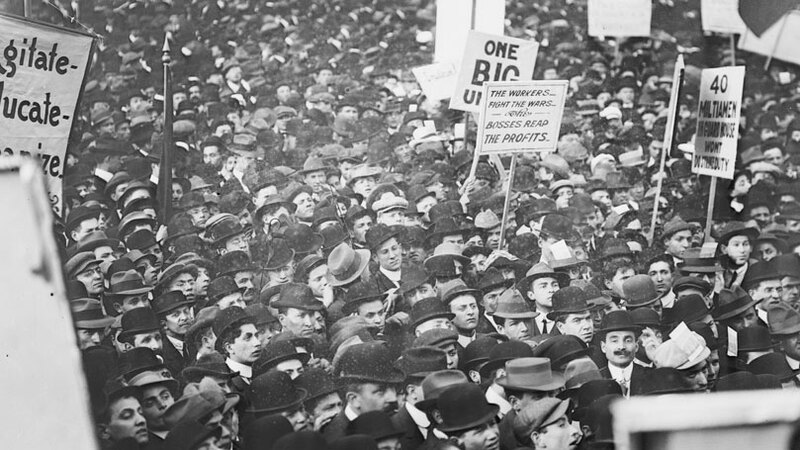 So shaken was the ruling class by the events of that May Day, by the ‘threat’ of the eight-hour day, that the full weight of the establishment was brought to bear to crush the movement for the eight-hour day. Eight working-class leaders were framed up on false charges and four of them, Albert Parsons, August Spies, George Engel and Adolph Fischer, were sent to the gallows. Ultimately though, despite these and other sacrifices, the working people, through their struggle, achieved the eight-hour day. Ever since May First has been celebrate worldwide as a commemoration of working peoples power and international solidarity. Too often, however, May Day has been forgotten here in the U.S., its birthplace. Not this year. This yearas every year millions of people from Jakarta to Baghdad to Paris to Johannesburg to Hanoi to Buenos Aires marched in the streets to defend their own rights and interests and to stand in solidarity with workers and oppressed people everywhere. But this year May Day had particular resonance right here in the United States. Just last week, Roger Toussaint, President of Local 100 of the Transit Workers Union was jailed for his role in leading the transit strike in New York City last December. He sat in prison, consigned there by an employers Judge backed up by the full weight and power of the employers law that bans strikes by public workers in the State of New York. Well, it didnt quite work out that way. After only eighty-two hours they were forced to set Roger Toussaint free. Forced by the peoples movement, by the massive march across the Brooklyn Bridge Monday, April 24, and by the massive, and growing, outpouring of support in the streets in front of his prison cell, and in particular by the prospect of 350,000 protesters marching past the prison demanding his freedom as part of Saturday May 29s massive March for Peace, Justice & Democracy. And then on May Day itself, millions of workers, native-born and immigrant, documented and undocumented, showed their muscle and their support for human and workers rights for all. Tens of thousands protested in city after city demanding dignity and promising, We march today, we vote tomorrow. It was a massive outpouring of solidarity that took aim at the anti-worker policies at the City, State and National levels, in particular those spewing forth from the boardrooms of the White House and the Bush Administration. What better way to celebrate May Day, born in the USA? May Day continues to stand as a symbol of the struggles for peace, for labor rights, for national independence and sovereignty, for womens rights, for immigrant rights, for equality, for a socialist future. Long live May Day!